Frederic Remington was a master at portraying the old West in both paintings and sculpture. His name is so well known that it is synonymous with Western art, one thinks of Remington when one thinks of Western art. The Outlaw is a remarkable composition because the horse is balancing on one front leg which presented a challenge to show in a bronze. Remington worked closely with Riccardo Bertelli, the head of the Roman Bronze Works foundry on this model and sent a Christmas card with a sketch of this model and asked "Can you cast him?" to which Bertelli replied "Do you think I am one of the Wright brothers?" 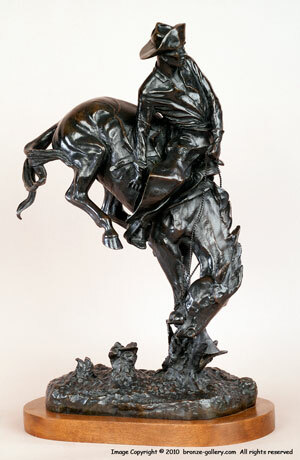 The foundry was able to use their lost wax casting technique to cast this complicated work, in which the horse and rider are balanced on one front hoof in suspended animation. The bucking horse's rump is straight up in the air and the cowboy leans back, balancing himself in the saddle as he keeps his seat. Our bronze of The Outlaw was copyrighted and cast under the authority of a company called Museum Collections Inc. in conjunction with the Buffalo Bill Historic Center in 1981. These authorized casts were made from an original in the museum's collection, thus insuring the sharp detail in this bronze. This one is cast 697 out of a edition of 1000 pieces and is so marked with the copyright information as well as the issue number on the bronze. We decided to offer a couple of the best high quality museum reproductions of Remington's famous bronzes because the prices of the original bronzes are way beyond most collectors. This is a way to enjoy his bronzes in a form almost identical to the original without spending a huge amount of money. There are only about 40 original Roman Bronze Works casts of this model, and one sold at Sotheby's NY in 2008 for $3,401,000, another sold at Christies, also in 2004, and brought $662,500. 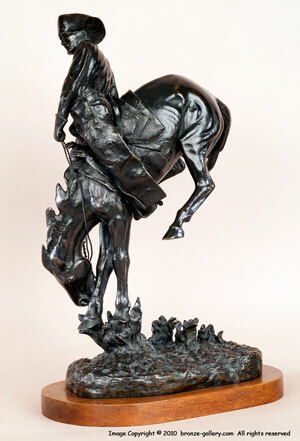 This posthumous cast from the original is reasonably priced and one can enjoy this fine Frederic Remington classic Western bronze without breaking the bank!